It's been a while since I've seen Ali from Yum Veggie Burger. She's busy having a career or something. So it was a pleasure to get together for drinks last week and discover we were also both free Sunday! 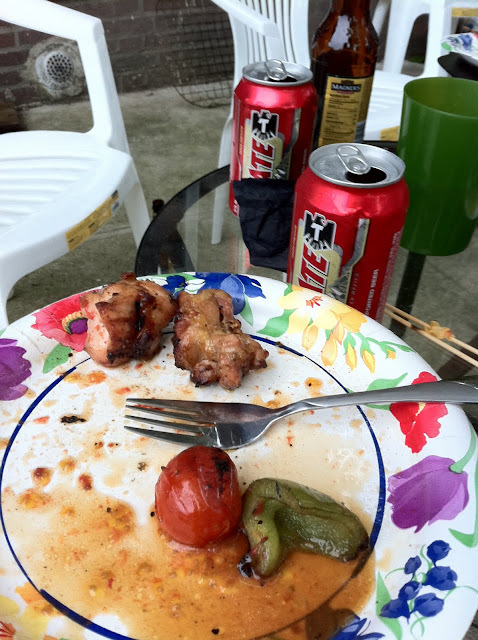 While the forecast may not have been the best for an outdoor grilling, we ended up making it work. Rather, I used my thunder god powers to stay the wrath of the sky. While Ali and Michelle were about making vegetarian options, I put together a chicken kebab concoction. 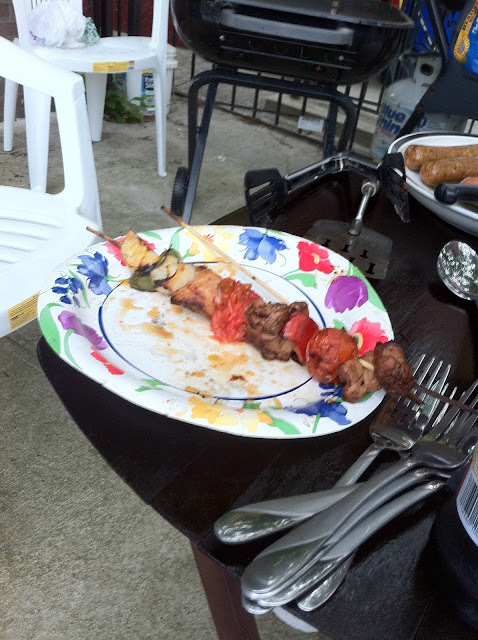 Unfortunately the results were so good that forgot to snap a shot until there was only one kebab left. Mix the first six ingredients in a large bowl. Add in chicken thighs and coat thoroughly. Let sit for 30 minutes. While the chicken is marinating, soak 8 wooden skewers in some warm water. When it's time, assemble the skewers. I did it with three tomatoes, one plantain, three chunks of chicken, and other bits as well in some order or other. The Thrifty Sifter, myself, and Logan polished off 8 kebabs, leaving only the below. Your soundtrack for this entry: John Coltrane - Greensleeves.